After some testing with friends & family users we are proud to launch our service officially today. We welcome all new users who come via linking blogs, media websites or startup directories. We already prepared some blog messages in the last weeks to give you some background information and some ideas how we were inspired. The beginning is the most important part of the work, said Plato, among others. And starting is done. 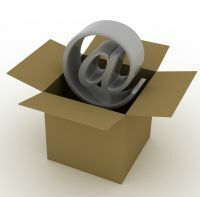 So have a look around and enjoy the new communication possibilities that this service offers. We are glad to have you here. We have accomplished a logo contest on the designer platform 99designs.com and got 195 logo designs, including a few dozen really good designs. We hope you like the new logo as well as us. Now we can start with PR and other actions. 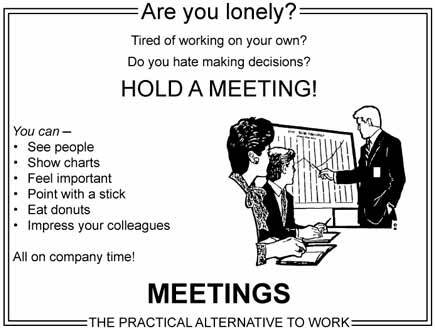 A Meetings Ad - "Meetings - The Practical Alternative To Work"
Thanks to Alex Scrivener & Mario Sixtus for this hint via Google+. Stig Carlsson added even more "benefits": "Practise herd mentality", "Master obstruction techniques", "Dominate your co-workers" and "Practise group indecision". 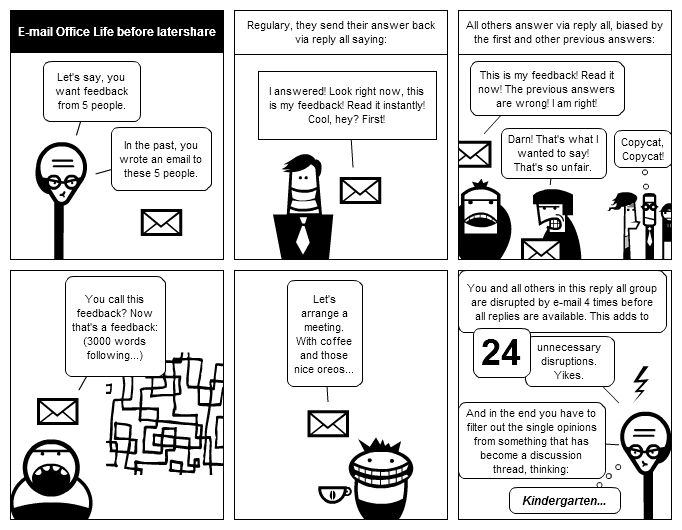 "Communication doesn’t always have to be in real time. It can be in what we call “slow time.” You can post something and three hours later someone can get back to you and then four hours later someone else can get back to you. And everything will work out just fine. Meetings basically make things happen all at once. And that means you’re pulling a bunch of people off their work to have this “right now” conversation. It’s very disruptive for a bunch of people. So if they can communicate over a long period of time instead, it’s much better." He is so right. 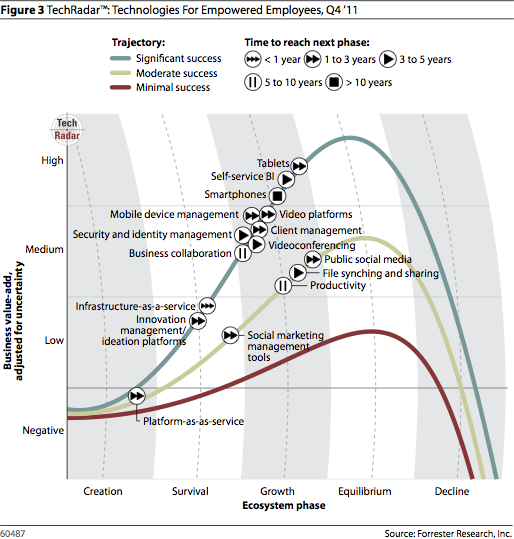 latershare is a slow time communication type. We believe that there are alternatives to meeting communication that are better regarding time efficiency, cost savings, originality - and more to-the-point. "It is more difficult to grasp the potential implications of forms that are not modeled on a comfortable, twentieth-century mode of communication. One such example is Twitter: Twitter users post short messages that usually have to do with whatever is happening to them at the time—whether it is intellectual, practical, social, or professional in nature—to create an ongoing log of activity across a community at the minute-by-minute level. Twitter is controversial precisely because it does not have an elder analog; it is a cousin of instant messaging, but its broadcast nature marks it as a different type of communication. Twitter has been described as fun, trivial, innovative, addictive, a waste of time, and potentially a powerful social networking tool; but its implications for teaching, learning and creative expression, if any, are not yet fully understood." latershare also is a kind of new communication type. It is a cousin of secret ballots, but it is not actually "secret" - since who posted what is finally visible to the group - and it has quite more use cases than that. It can be used without being at the same place, with asynchronous input and synchronous output. latershare is in a way a virtual ombudsman, a different kind of mail server, a content escrow broker. In particular, we do not know yet how latershare will be ultimately used. There are many possibilities, but we'll see which will have a resounding success. I'm curious. The first latershare blog entry. What I'm saying? Welcome? Hello? In the latershare.com blog I'll publish news regarding the development of this platform, inspiration, information on use cases and public latershares and responses from the environment in irregular sequence (with about 2 posts/month). The Bertelsmann CEO Hartmut Ostrowski said at this year's dmexco: "In the future it will be possible to come out big with a small idea. Small firms have more advantages over large companies here." That's what I think. So we are working on that now. I wish you an enjoyable read and always good results through the use of latershare.